Suborbital spaceflights, carrying scientific payloads, allow scientists not only to test the feasibility of their payloads, but they also provide the basis for refining scientific hypotheses to be later tested on the International Space Station (ISS). Therefore, it is essential to establish robust pre-flight procedures in order to take advantage of this unique research platform to facilitate payload delivery. In the present study, we assessed zebrafish larvae behavior as a precursor for the future suborbital spaceflight involving research on the musculoskeletal system. 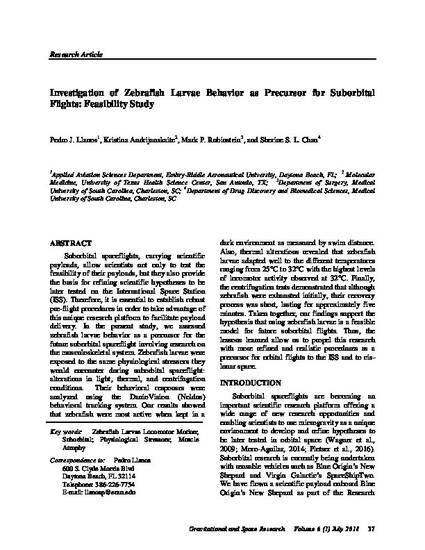 Zebrafish larvae were exposed to the same physiological stressors they would encounter during suborbital spaceflight: alterations in light, thermal, and centrifugation conditions. Their behavioral responses were analyzed using the DanioVision (Noldus) behavioral tracking system. Our results showed that zebrafish were most active when kept in a dark environment as measured by swim distance. Also, thermal alterations revealed that zebrafish larvae adapted well to the different temperatures ranging from 25°C to 32°C with the highest levels of locomotor activity observed at 32°C. Finally, the centrifugation tests demonstrated that although zebrafish were exhausted initially, their recovery process was short, lasting for approximately five minutes. Taken together, our findings support the hypothesis that using zebrafish larvae is a feasible model for future suborbital flights. Thus, the lessons learned allow us to propel this research with more refined and realistic procedures as a precursor for orbital flights to the ISS and to cis-lunar space.